Another ransomware attack has made headlines with the city of Del Rio, Texas, announcing on January 10, 2019, that the servers at City Hall were disabled, according to a press release. 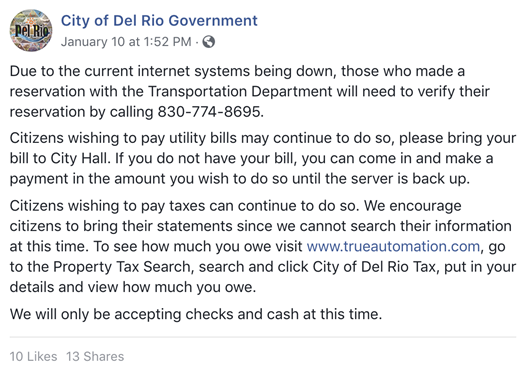 As has been the alternative method of communication for many organizations that have been impacted by cyber-attacks, Del Rio turned to social media, using Facebook to inform citizens of alternative payment options available to them. After reporting the attack to the FBI, Del Rio was referred to the Secret Service. “The City is diligently working on finding the best solution to resolve this situation and restore the system. We ask the public to be patient with us as we may be slower in processing requests at this time,” the press release said.